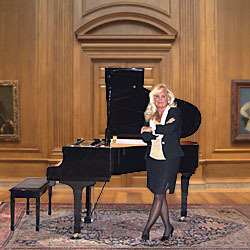 Providing exceptional piano and a solid reputation for professionalism, Kathie Nicolet will surpass your expectations to ensure a very successful, memorable event! You will discover why her valued clients return year after year. Planning an awards presentation, cocktail reception, trade show, product launch, Chicago yacht charter, grand opening, Board of Directors' Meeting, or holiday party? This industry leader who has over 25 years of experience knows and understands the importance of her clients' requirements. Music sets the tone for your entire event. Without it, it's only a meeting. The following is a list of selected corporate events Kathie has performed for that concludes with some client testimonials. A comprehensive listing of both is available upon request. Mayor and Mrs. Richard M. Daley's Holiday Reception For Cabinet/Department Heads By Invitation Of The Mayor's Office Of Special Events and The Department Of Protocol - Chicago Historical Society. 20th Anniversary of Sundance Film Institute (Park City, Utah) honoring guests ~ Academy Award Winner/Founder Robert Redford and Board of Directors member, Ms. Sally Field, hosted by Mayor Richard M. Daley, Mrs. Maggie Daley, and the CEO of Bank One / Chicago. Retirement Reception for General Manager, Joyce A Moffatt, Joan and Irving R Harris Theater for Music And Dance/Millennium Park Chicago held in a private home on North State Parkway/Chicago. American Heart Association Luncheon Keynote Speaker: Mary Ann Childers WBBM-TV Channel News - Chicago Hilton And Towers. Christening Parties For Channel 5 WMAQ TV News Anchor Allison Rosati at Maggiano's Oak Brook. Press Parties Drury Lane Theater Oak Brook Tony Bennett, Pia Zadora, Debbie Reynolds, Donny and Marie Osmond, Peggy Lee. Santa Fe Railway Train trip (Rose Bowl Special) bound for Pasadena, California. Performance aboard the train departing Chicago with stops for key accounts including the Brewmaster of Anheuser-Busch in St. Louis, Missouri. Con Agra Foods Receptions (National Restaurant Association Convention/McCormick Place) Sutton Place Hotel. Loyola University Departments Of Opthalmology and Neurosurgery Holiday Receptions ~ Oak Brook Hills Hotel. Chicago Cultural Center's Chicago "Water Works Concert Series " Chicago Water Works Tourism Building. United Cerebral Palsy Fundraiser (Chicago Chapter) ~ Great Chef Tasting Party ~ Hyatt Lisle Hotel. Meet The Stars Receptions ( Schaumburg Prairie Center For Performing Arts) Donald O'Connor, Steve Allen, Jayne Meadows, and Comedian, David Brenner. Illinois Academy of Family Physicians Convention-Doubletree Rosemont Hotel. The Appraisal Institute (Chicago Chapter) Reception - Cheney Mansion. Mercedes Benz Receptions for SL 500/600's Loeber Motors Chicago and Lincolnwood Locations. Great Chef Fest for Chicago Chapter of United Cerebral Palsy at the Hyatt in Lisle. American Heart Association Luncheon at the Chicago Hilton and Towers. Keynote Speaker: Mary Ann Childers from WBBM-TV Channel 2 News. Million Day at Arlington International Racecourse, Arlington Heights. Jean Paul Gaultier Fragrance Launch Reception for Marshall Field & Co. at Sutton Place Chicago . University of Birmingham England Alumni Dinner - Chicago Historical Society. Illinois Crime Commission Dinner (televised) Drury Lane Oakbrook. Keynote speaker: Crime Reporter John Drummond, CBS News/Channel 2. Fundraisers For Senator 'Pate' Philip, Senator Lee Daniels and State Treasurer Judy Barr Topinka / Maria Pappas. ALSAC Convention ( Danny Thomas-ST. Jude Children's Research Hospital ) - Keynote Speaker: Oprah Winfrey. Press Parties - Pia Zadora, Tony Bennet, Donny Osmond - Drury Lane Theatre, Oakbrook. DePaul Music Mart Concert Series - Chicago Music Mart. Wellesley College Alumni Dinner ( Chicago Historical Society ) - Keynote Speaker: ABC Television's, 20/20 Reporter Lynn Sherr. Chicago Art Institute's After Hours Reception. Channel 32 Fox Sports TV (televised) Annual March of Dimes Fundraiser at Chicago Hilton And Towers Hotel. University Of Rochester (New York) 150th Birthday Celebration at The Chicago Historical Society. Beltone Electronics Ccorporation (Service Instruments Division) Awards Dinner at Chicago Museum Of Science And Industry Rotunda --At The Titanic Exhibit. .
" Your style and presence brought a special touch of refinement to Senator "Pate" Philip's reception which added immeasurably to the overall success of the evening. And, as coordinator for "Friends Of The NW Suburbs" fundraiser for Mr. Lee Daniels (Speaker of the House Of Representatives- Illinois), it was my mission to provide high class musical accompaniment that would combine enjoyment and easy listening, while being nonintrusive during conversations. Your styling and musical interpretations were perfect and set the tone for a gracious evening. Gratefully, your skills are at such a level that you more than met our criteria. Comments overheard were " Looking at her is as pleasant as hearing her play." I will underline that one.. You looked SMASHING." Sincere thanks for your enthusiasm and professionalism ~ We will be engaging your services at many upcoming events." " Today, we have had many calls asking us how to reach you. Calls are a barometer in our business and always a sure sign of how well the event went .. if people copy your entertainment!! With the way the telephone has been ringing.... you were a GREAT success!!!" " On behalf of the Board Of Directors of the Prairie Center Arts Foundation, I want to thank you for playing for the Donald O'Connor reception. This was a lovely evening made more special by your music. Steve Allen and Jayne Meadows are planning a reception next month, and we would love to have you a part of it." "Words cannot express the warmth and beauty you brought to the luncheon at the Lodge today. Your performance was exceptional!! I received rave reviews on your presentation of music." "Thank you very much for providing the beautiful and festive pre-dinner music at our Department of Medicine's Christmas party. I was extremely pleased with your fine performance as well as your kind and courteous manner. We received several comments on what a splendid job you did." " Thank you for providing entertainment services at Arlington International Racecourse during the 2000 meet. We at the track have enjoyed having you here throughout the Summer. You added to the delight of our guests and helped make this season an overall success. We look forward to contacting you next season." " Thank you for playing for our annual tradeshow. Your music provided just that special touch we were looking for to convey our theme. I have heard so many positive comments from those who attended. Incorporating our White Hen Pantry jingle into your repertoire for the day was greatly appreciated! It was a pleasure to work with you, and I will definitely not hesitate to call you again when the need arises." Cindy / Marketing Dept. - White Hen Pantry, Inc.
" Just a quick note to thank you for playing the piano so beautifully at our Holiday Party. You certainly set the standard for our holiday season social events in years to come! Not only that, I understand that you were a pleasure to deal with when setting up details. " I will expect repeat performance. Thanks, again." "Thank you so much for your kind comments regarding Kathie Nicolet. I agree, Ms. Nicolet is kind and courteous as well as an exceptional pianist. I am so pleased that you enjoyed hearing her play and will be sure to share your comments with Ms. Nicolet as she will enjoy reading them as much as I did."